Scroll through the newsfeed on any social media platform and it won’t be long before you spot some inspirational, famous, and/or hilarious quotes. Quotable sayings and their associated hashtags tend to get a lot of attention in terms of likes, retweets, engagement, and shares. One example: On Instagram, #quotes has over 55 million posts! So what’s the big deal? 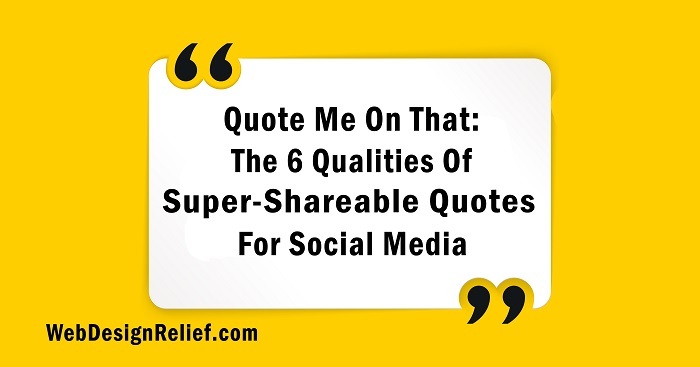 Should you be sharing quotations with your followers too? The social media experts at Web Design Relief explain how posting quotable sayings will help you increase engagement, grow your platform, and strengthen your author brand. Adding images can give your posts even more punch, so consider matching each quotable saying with an evocative image to attract more attention. If you’d never heard of Rumi before social media, you certainly know about him now. This medieval Muslim poet and scholar is revered for his mystical poetry based on hope, love, and spiritual awakening. There’s beauty in his use of language and a peaceful wisdom in his work. Insight and wisdom are why inspirational quotes appeal to such a large audience. Readers enjoy a moment to pause, step out of themselves, and contemplate the greater world. Let’s face it—sometimes it’s hard to get out of bed in the morning. A motivational quote from a brilliant physicist might be just what you need to straighten your shoulders and face your day. The right quote can be as comforting as a pat on the back and as energizing as a cup of strong coffee. Human emotions can be powerful and even overwhelming. Quotes that describe both fragile and extreme feelings exude a sense of empathy and deep humanity. Knowing that others have felt as we have makes us feel less alone. Fellow authors and writers adore literary quotes. Literary quotable sayings tend to be sweet little gumdrops of concentrated wisdom, written in perfect meter. Quotes about the writing process, filled with the joys and the sorrows, make us feel part of a greater community of like-minded folks. Honoring the season with appropriate quotes brings us out of our isolation for a moment to contemplate the passing of time and the scattered communities of those celebrating. Quotes that reflect timely events can stir up a hornet’s nest on social media these days, but for pundits, those in the political arena, or writers of political books, that can mean getting more attention, engagement, and a lively exchange of ideas. Because of their universal appeal, the quotable sayings you post on social media don’t have to relate directly to your books to attract engagement. But if you can connect a quote to your author brand, you’ll draw new followers to your platform. Question: What’s your favorite inspirational, motivational, or literary quote?